Bravo Concealment adds to its BCA holster line with a new model, the BCA 3.0, looking to offer OWB fans a comfortable yet slightly adjustable holster. Swathed in Kydex, the BCA 3.0 enters into an already overcrowded holster market. So, what sets the BCA 3.0 apart from other OWB rigs and how does it stack up when put to the concealment test? Guns.com took the BCA 3.0 OWB Holster for a test ride its first month on the market to find out. 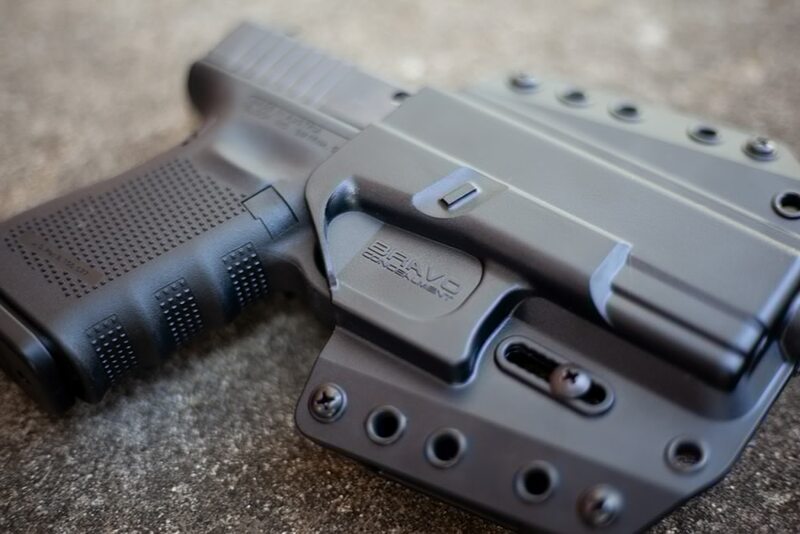 The Bravo Concealment Adaptive 3.0 rig is an outside-the-waistband holster, though a simple switch of the pancake style belt loops converts it to an IWB rig. Bearing a resemblance to Bravo Concealment’s original BCA Model, the 3.0 delivers a molded Kydex design. 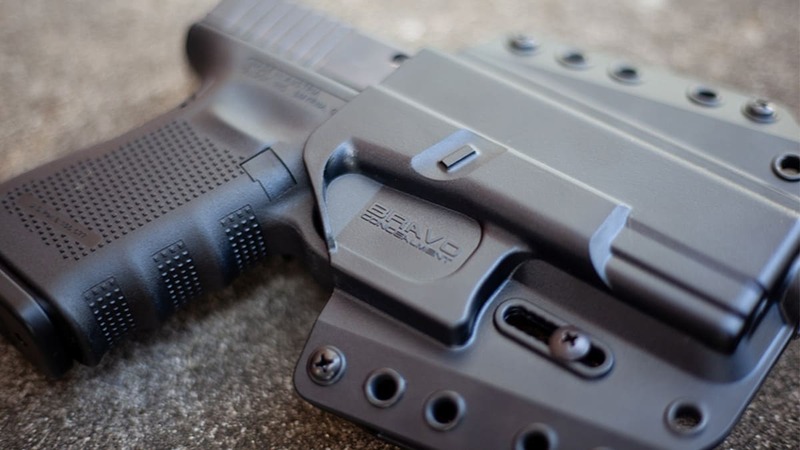 For this review, Bravo Concealment shipped a BCA 3.0 model for the Gen. 4 Glock 19. Though the BCA 3.0 falls under Bravo Concealment’s BCA heading, it does enjoy some differences from the original model – namely, in its customized retention settings. Gun owners can now benefit from tuning to either medium retention or heavy retention depending on user preference. The BCA 3.0 also boasts the ability to pair with popular gun accessories that some holster makers routinely forget to accommodate, such as tall sights, threaded barrels and RMR optics. While my go-to style of holster is typically IWB, in the appendix position to be specific, I decided to swap out my gear and give the BCA 3.0 a run. As temperatures began to steadily drop and outer garments became a necessity in my town, there seemed no better time to test out the OWB rig. The BCA 3.0 OWB Holster had arrived a few days after Bravo Concealment’s announcement in early October 2018 revealing the new holster. At that time, the company had a limited model selection, so the BCA 3.0 OWB I received was created for the Gen. 4 Glock 19. No issue there since that’s one of my favorite carry guns. The BCA 3.0 OWB isn’t what you call a “pretty holster.” Decked out in black, the BCA 3.0 looks like Frankenstein’s monster with its bolts and screws on display. Don’t let looks fool, though. The BCA 3.0 may not win any beauty contests, but it certainly gains points for comfort and retention. Outfitted with an adjustable retention screw, users can tweak their gun’s fit with a few turns. For those with the strength of Thor, there’s a heavy retention setting and for those that prefer a mid-range retention setting there’s a medium retention setting. The holster came tuned for heavy retention, but after a few struggles and some marks on my gun, I decided to dial the retention back to the medium level. The holster still maintained a grip on the gun but allowed me to draw in a more efficient manner. I appreciate the simplicity of the retention settings. The retention screw is made in such a way that it loosens easily without having to removed completely – a nice feature for those of us prone to dropping and losing screws while working on gear. One of the biggest advantages to the BCA 3.0’s design compatibility with aftermarket accessories. Providing space for RMR cut-outs, threaded barrel clearance and tall sights clearance up to .355-inches, the BCA 3.0 brings some elevated features to the under $50 holster market. Gun owners who want some perks of high-end holsters but can’t quite shell out the cash for pricier models should find the BCA’s offerings meet their needs. Offering a reduced footprint over its predecessor, the BCA 3.0 profits from a slimmer profile and reduced size. Donning, the OWB holster, I immediately noted how comfortable it was to carry. 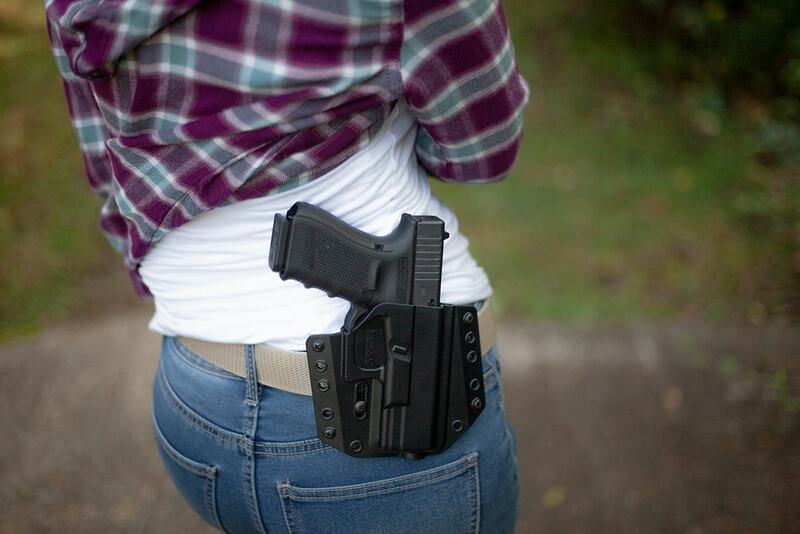 Given my status as a petite gun owner, big holsters usually appear and feel even bigger on me; but the BCA 3.0’s scaled down size made it manageable – even on a micro warrior like myself. While I couldn’t sport a t-shirt with this holster, I was definitely able to use layering with cardigans, over-shirts and jackets to conceal the Glock 19 with the BCA 3.0. Offering pancake style belt loops, the BCA 3.0 practically melted into my side allowing the Glock 19 to rest securely against me. Truth be told, I often find OWB holster’s obnoxious anywhere but the range (and sometimes there too) but the BCA 3.0 offers a Kydex design that isn’t obtrusive or a nuisance. Paired with the ability to convert to an IWB rig by swapping out the belt loops for belt clips, some consumers will feel they’re getting more bang for their buck. For me, despite the fact that the BCA 3.0 is on the slimmer side when stacked against other OWB holsters, it’s still too big for effective IWB especially in the appendix position where I prefer. 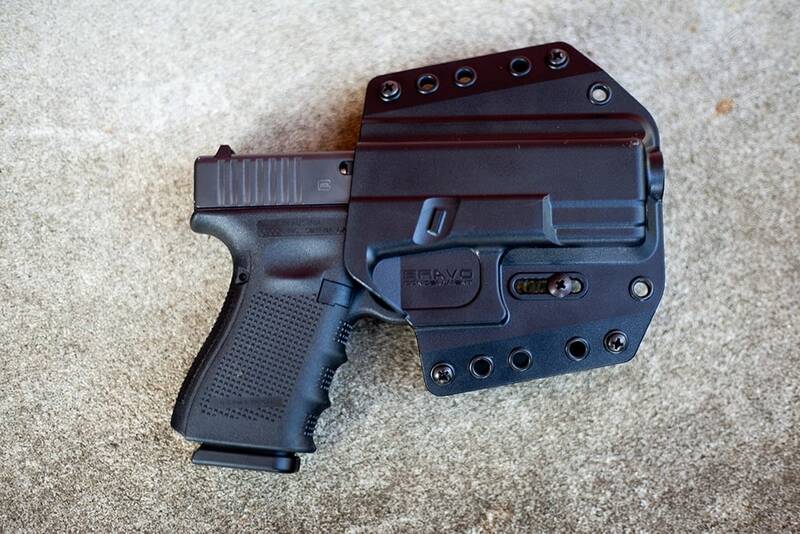 I don’t see myself converting this OWB holster to an IWB number anytime soon; but there might be other gun users who value the perks of a 2-in-1 holster style. The BCA 3.0 OWB Holster proves to be a solid design for those budget conscious consumers who prefer the look and feel of Kydex without the expensive overhead. Slipping in the crowded holster market with a price tag just under $50, the BCA 3.0 OWB from Bravo Concealment offers enough extras to entertain gun owners without going too over the top with pricing.